Successful marriages are built on three cornerstones – commitment, love and trust. However, they start with a fourth cornerstone – a beautiful engagement ring that symbolizes the other three pillars. Choosing a diamond ring for an engagement is one of the most important, and difficult, decisions that any man can be faced with. Given the huge array of styles – as well as so many different quality and colour choices – many get as nervous about selecting the ring as about actually making the proposal. So, with this in mind, what are some of the most important things about choosing an engagement ring style? Perhaps the most classic – and safe – choice is a diamond solitaire. 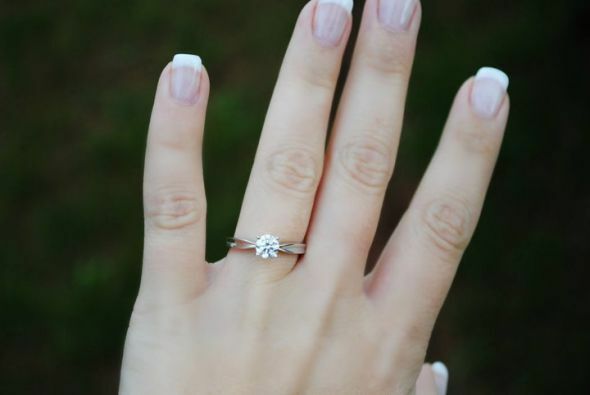 This is a single beautiful round diamond set on a simple band. A diamond solitaire is elegant and graceful, and will complement the hand of any woman. Popular choices for the band include yellow and white gold, although platinum is a premium option that is both more expensive and more durable. If the bride has a classic sensibility, but likes things that set her apart, then a solitaire with a different shape of diamond is something to consider. The most popular alternative cut for a diamond engagement ring is the princess cut – which is an elegant square shape. Emerald cut diamonds are also popular, and have been a frequent choice of celebrity brides over the last few years. Other shapes include oval, heart and pear, as well as lesser-known variants such as marquise, asscher, radiant and cushion. For those with a larger budget, a three stone ring can be a good option. This is similar to a solitaire, except that the central diamond is flanked by a diamond on each side. These types of rings tend to be more glamorous than simple solitaires, so they are a perfect choice for a bride who likes a little bit of extravagance in her fashion. Although it is not held universally, some people believe that the three stones represent the past, present, and future – extra symbolism which can add meaning to the special occasion. For the ultimate in eye-catching glamor, the split shank setting is the perfect choice. With this, the band actually splits in half as it nears the central diamond, allowing the diamond to be surrounded with other decorations or smaller diamonds to accentuate the beauty of the piece. Some brides choose to use this both as their engagement and wedding ring, rather than having two separate ones – but future grooms should always ask whether this is the case prior to the wedding, rather than making a potentially embarrassing assumption. Whatever ring the man chooses, it is an extremely good idea to make sure that the diamond is certified prior to making a purchase. This is an official assessment of the weight and quality of the diamond that is made by an unbiased third-party laboratory. The most well known laboratories for certification are the Gemological Institute of America and the American Gem Society.